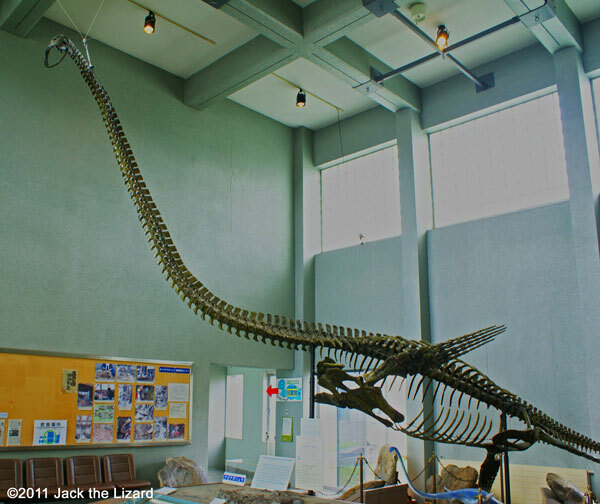 Mukawa Town Hobetsu Museum opened to exhibit Elasmosaurus, found in the mountain of Hobetsu, in 1982. 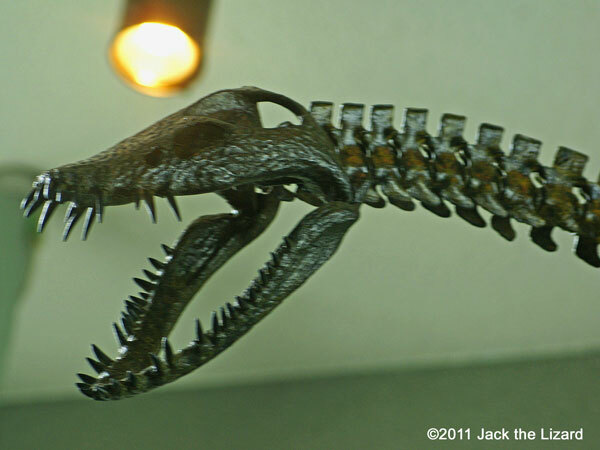 The Elasmosaurus was named Hobetsu-araki-ryu after the fossil hunter Sintaro Araki. Huge Hobetsu-araki-ryu welcomes you at the entrance hall, but it is just a beginning of your tour. The museum has fossils of very rare sea turtles, mosasaurus, ammonite and more from ocean in Mesozoic era. Hobetsu-araki-ryu is 8 m (26 feet) in length. 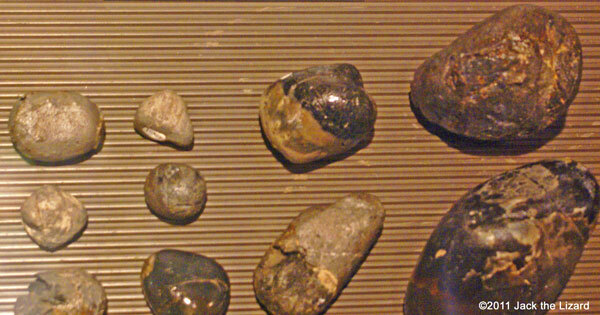 The gastroliths found from the stomach of Hobetsu-araki-ryu. Elasmosaurus would have taken stones to have stable balance in water and also to grind food. Some plesiosauaria were found with more than 600 gastroliths in its stomachs. Plesiosauria including Elasmosaurus such as Hobetsu-araki-ryu had small teeth that might not be strong or sharp enough to crush hard shells. From its stomach whole ammonites were found along with fish and octopus. Mesodermochelys. A specimen of Loggerhead turtle is behind. Take a look at the differences between two. Mesodermochelys means Mesozoic leatherback sea turtle. The large Mesodermochelys could have reached 2 meter (6 and a half feet) in length including head and tail. 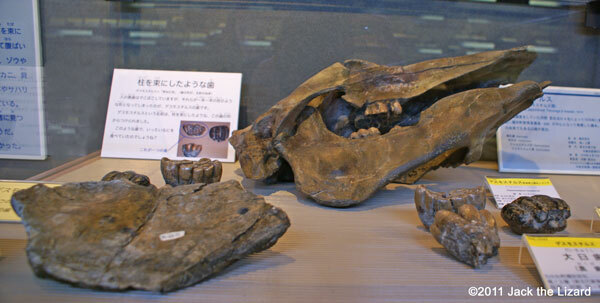 The Mesodernochelys had inhabited Hobetsu that was in the ocean 70 million years ago. 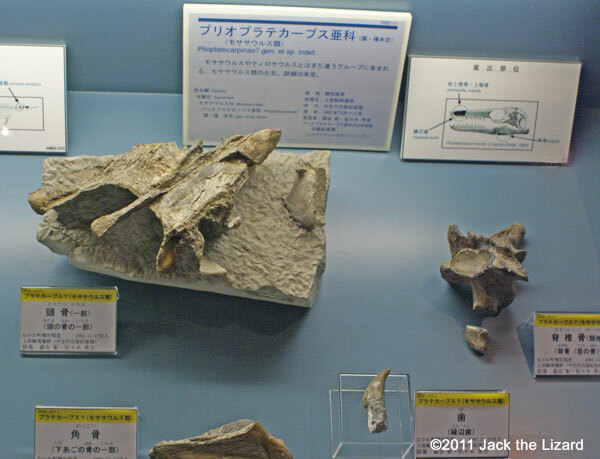 The fossils of Mesodermochelys have been found only in Japan and most of them are from Hobetsu area. Currently, sea turtle can be divided in 7 species (6 species in Cheloniidae family and 1 Dermochelyidae family), while about 30 species of the Mesozoic sea turtle (Cheloniidae, Dermochelyidae and extinct family of Protostegidae) were found so far. But why had the ancient sea turtles branched out so many species? During the Mesozonic era the climate was milder than now, so sea turtles probably could have stayed in the same region and flexibly adapted to the natural environment in which each species live rather than migrated. mainly eat soft food such as jelly fish. It was thought that Mesodermochelys ate sea shells and crustaceans. Why were the oceanic animals found in the land of Hokkaido? Japan during the late Cretaceous Period. 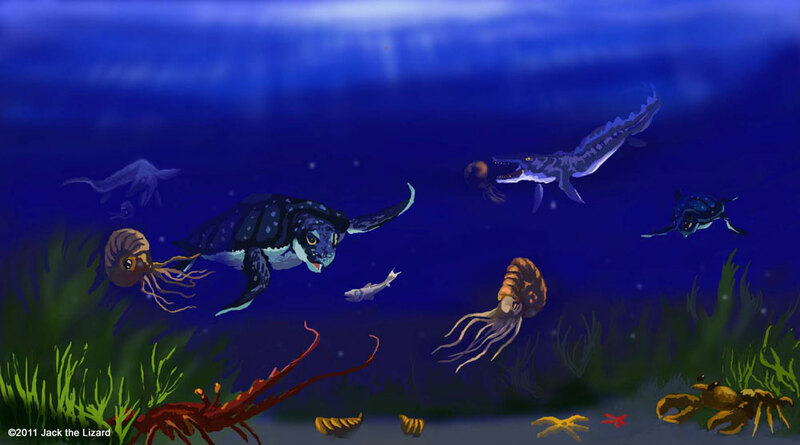 The animals found in Hobetsu such as Plesiosauria, Mosasauridae and sea turtles were oceanic animals. 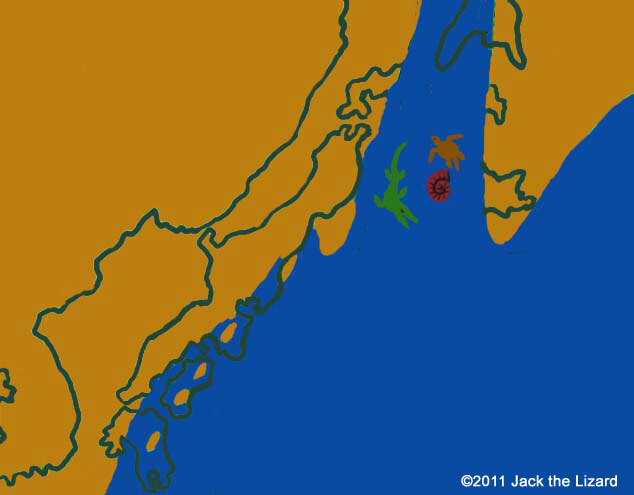 Hokkaido at that time (90 to 80 million years ago) was divided in two lands on the sides of channel. So Hidaka Mountains which runs through center of Hokkaido now were under the sea back then. Plesiosauria disappeared at around 70 million years ago while sea turtles and Mosasauridae still survived. 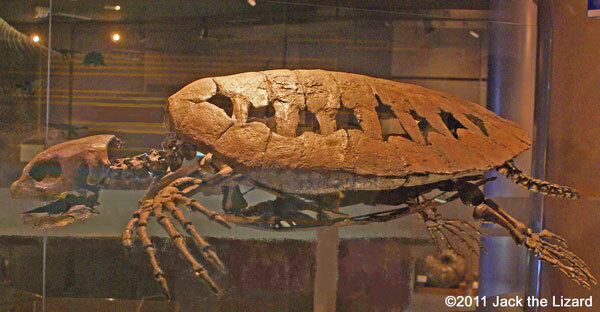 The fossil of Mesodermochelys was found from Hakobuchi group, the stratum of the Cretaceous. 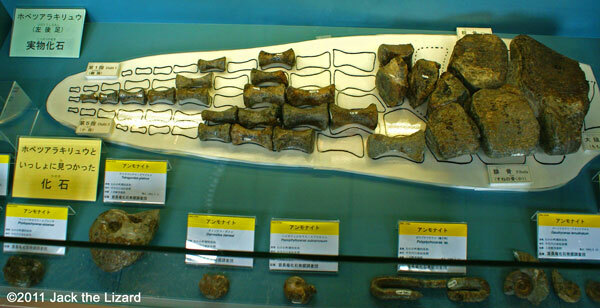 The fossil sites were mainly around Pankerusano stream around Mukawa River in Hobetsu area. The stratum contained the fossils of Radiolaria which help to tell how old the stratum was. 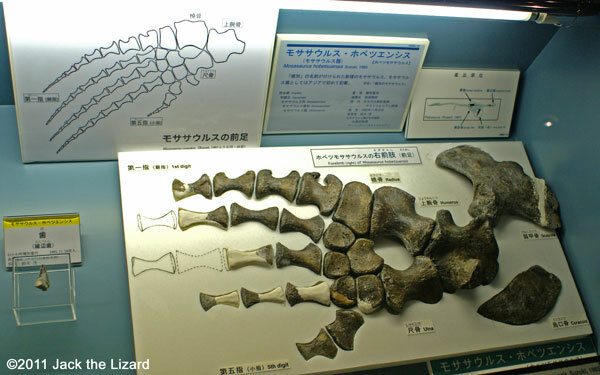 100 of turtle fossils were found in Hokkaido and 50 of them were from Hobetsu. Most of them belong to sea turtles. 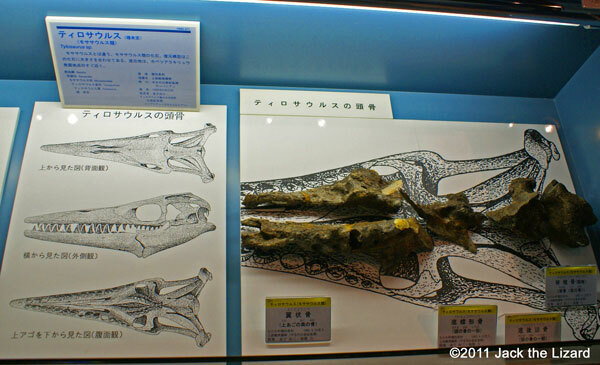 Hobetsu Museum has 17 fossils of Mesodermochelys. The smallest is 40cm (1.3 feet) and the biggest is 150cm (5 feet) in length. All of them are very precious to understand the growth of Mesodermochelys. Moreover by examining the structure of shell crystals some specimen is considered as the sea turtle’s egg. This was found from one block of rock. The rocks containing the fossils consist of limestone, so formic acid is used to melt the rock to take the bones out. Formic acid however may melt the bones as well, so acrylic resin paraloid is applied on the exposed bone for protection. “All the procedure takes time, but it is very important for the museum to accommodate variety of fossil specimens. I believe our displays help our visitors to imagine diversified animal world of the Cretaceous Period,” said Kazuhiko Sakurai, the curator. Sakurai graduated from Hokkaido University of Education and worked for a geologic survey company, then he has taken the job for a curator of Hobetsu Museum. 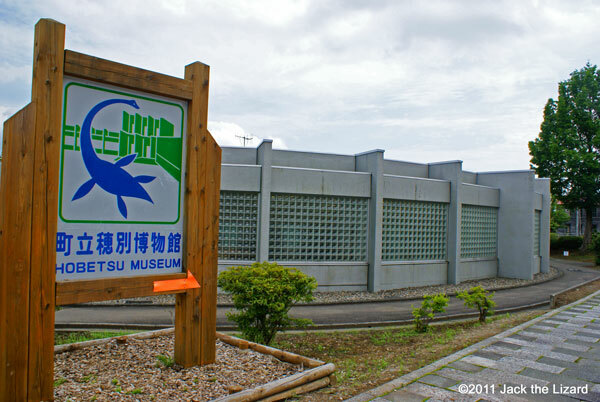 Sakurai think that Mesodermochelys is one of the spotlights in the museum. 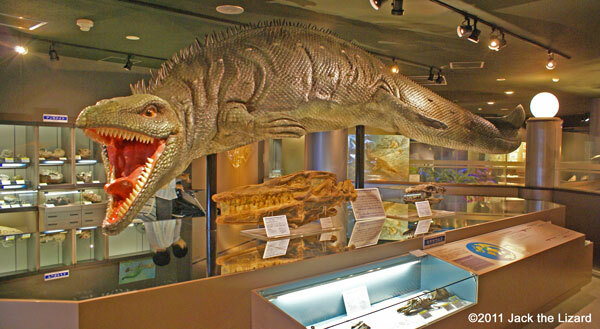 “I believe visitor can visualize Mesodermochelys swimming beside Mosasaurus through our collection. Although Mesodermochelys had been extinct long time ago, it is surprising that their family still survive on the earth as sea turtles. I want the visitors to understand the ancient world is closely connected to the current nature. 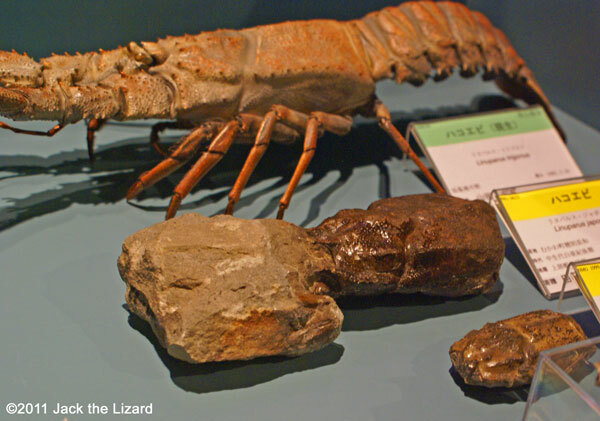 To support visitors’ imagination more marine animals such as arthropod Callianassa petalura and Retroplumidae fossils are on displayed together too. They were in the same ocean with Mesodernochelys.” said Sakurai. Desmostylus (The scull is replica.) Mammal similar to hippopotamus existed from Oligocene through Miocene (23 to 10 million years ago). They probably had lived around waterside. 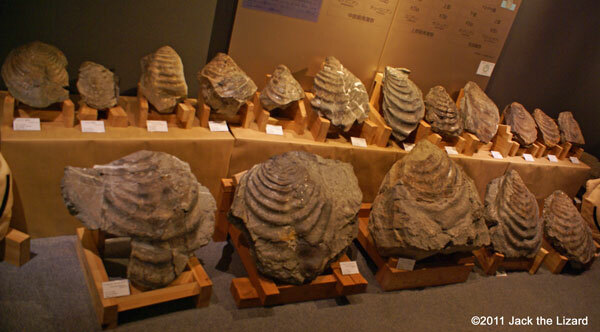 Many of the fossils in the museum were donated by the people in the town of Hobetsu. Sakurai and the museum staffs order those fossils and record any related information such as the location found, surrounding environment, and the fossil conditions. These procedures make stuff easy to reply quickly to any inquiries from people not only in Japan but also in foreign countries. “Museum staffs also go to the sites for the fossil research and collection, but we cannot grow our collection without help of local people. All the stuffs are deeply appreciated about that,” said Sakurai, emphasized the museum has developed with the cooperation of the supporters. 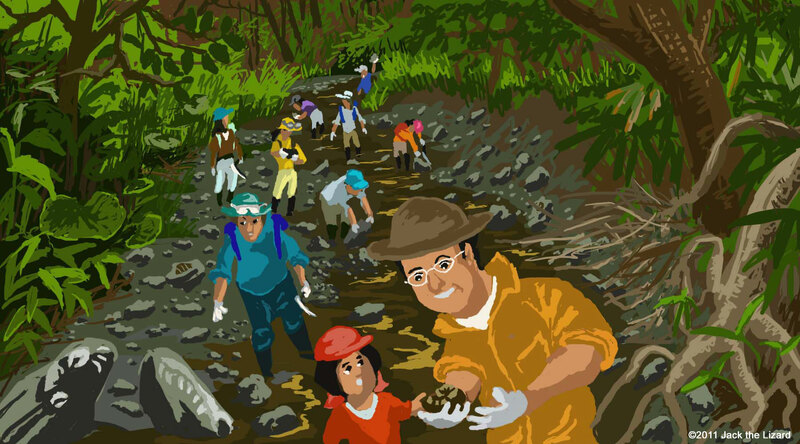 The curator Sakurai guides the participants to the fossil site. They can find some fossils of ammonite, inoceramus, crinoid, coral, shark teeth. Marine reptiles revive more and more. 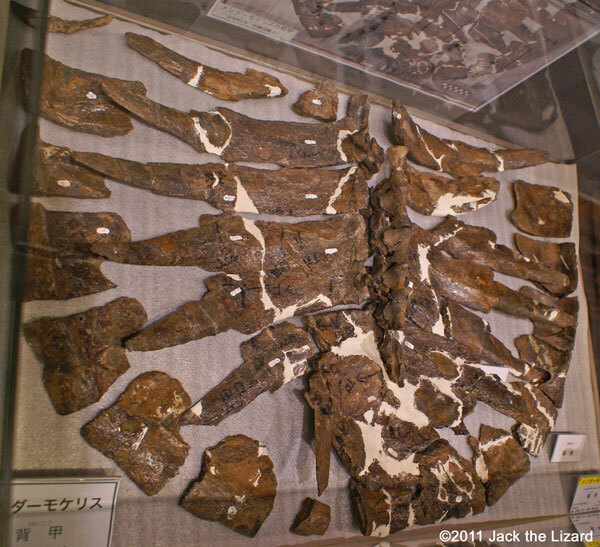 More marine lizard fossils have been found in Hobetsu. 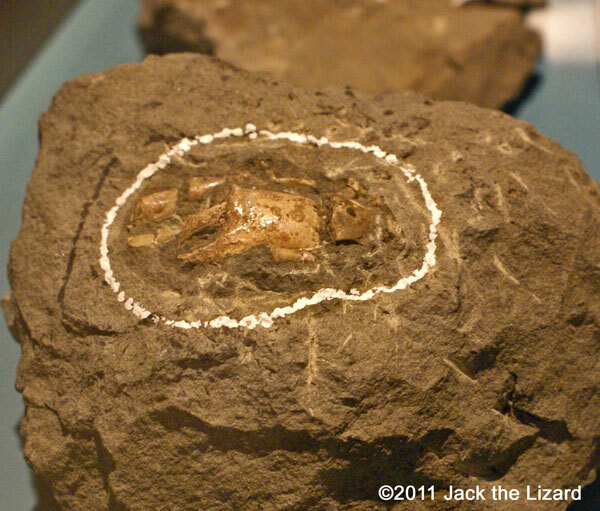 A skull of Mosasaurus was found last year. That was almost complete head fossil with little missing part of the front of mouth. The experts have found unique features of this specimen and it might be a new species of Mosasaurus. The museum holds the special exhibition “The Teeth its form and useage, Plesiosauridae and Mosasaurus” from July 23 to October 30 in 2011. Teeth are the most likely to be fossilized among all the body parts of vertebrates. The exhibition introduces what they ate and how they used their teeth based on the information we got from the teeth fossils. 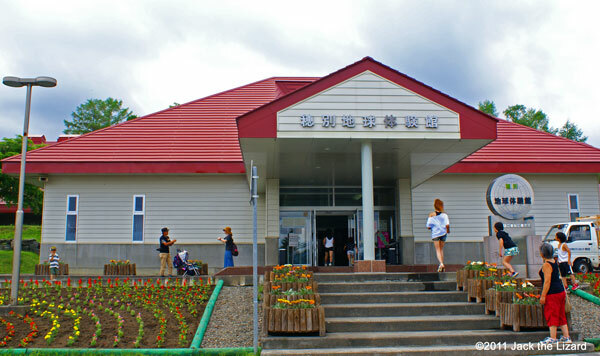 Hobetsu Earth Hands-On Museum is located just across the road from Hobetsu Museum. 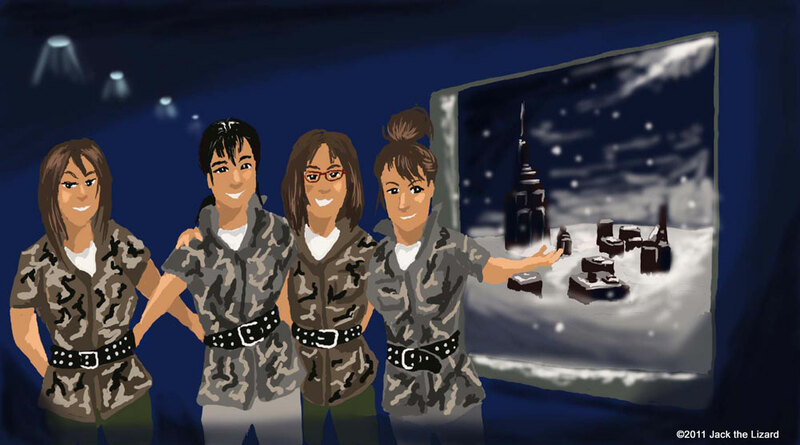 The attendants guide you to rainforest, ancient ocean, desert and so on. The temperature and humidity change depend on what the environment is, so you can be in the really freezing air of the glacial period in the ice age room. It is very fun and interesting to experience those while you listen to the attendants explaining the unique feature of the rooms. 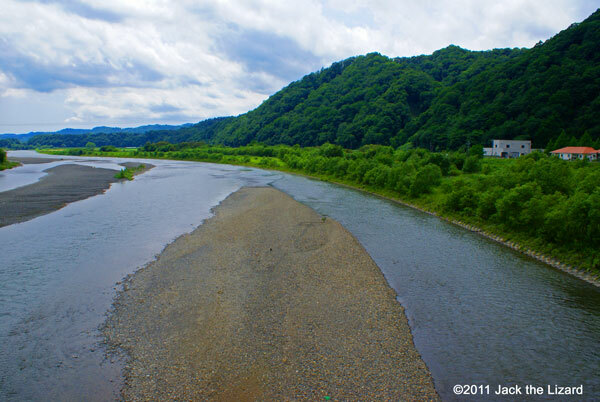 Mukawa-river goes through Hobetsu town、some of the fossils are found in the branch of this river. The attendant ladies knowledgeably guide you each room at Hobetsu Earth hands-on Museum. The ice age room has the simulated display of the town of New York covered with snow. 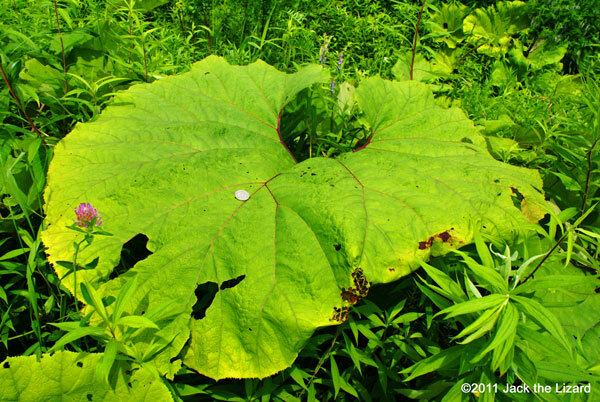 Bog rhubarbs have huge leaves in Hokkaido. Look at the 100 yen coin on the leave. It looks so small on such a big leaf. The nature of Hokkaido is different from the other part of Japan. For example, you can see turtles sunbathing pretty much everywhere in Japan but not here, because there are no wild turtles in Hokkaido. Also in forests of Hokkaido have stag beetles, but no wild Japanese rhinoceros. Instead of such little animals Hokkaido has variety of mammals such as brown bears, Hokkaido Sika Deer, Ezo red fox and more.